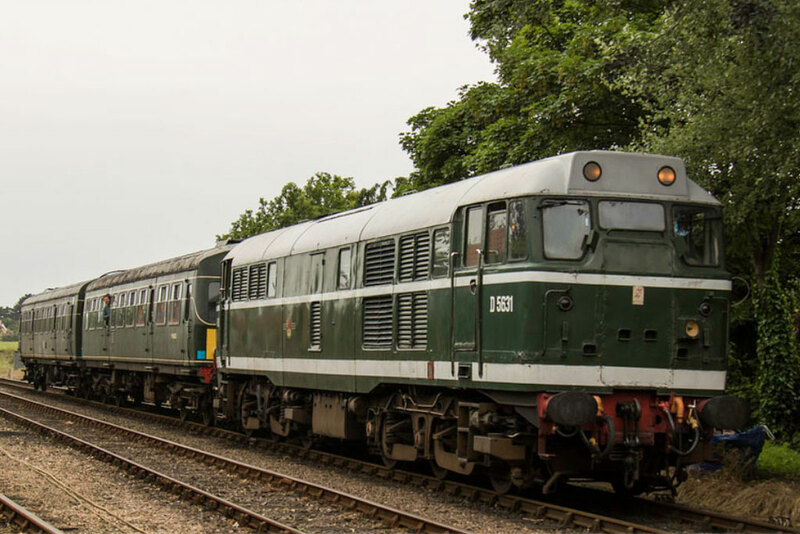 The British Rail Class 31 diesel locomotives, also known as the Brush Type 2 and originally as Class 30, were built by Brush Traction from 1957-62. They were numbered in two series, D5500-D5699 and D5800-D5862. The class was developed as a result of the British Transport Commission’s famous 1955 Modernization Plan. Brush of Loughborough adopted its A1A- A1A design for Ceylon Railways leading to the prototype D5500, the first of a batch of twenty, being delivered in October 1957. Further locomotives followed and the BTC were obviously impressed with the class and further orders were placed for what became the “production examples”, eventually totalling 243. Around 26 locomotives have been purchased, and preserved, for use on heritage railways around the UK. D5631 is a Brush type two locomotive, later class 31, built at Loughborough in 1960. The M&GN Society’s Class 31 was delivered new from Brush Traction at Loughborough (works no. 231) to Norwich shed 32A on 7th of July 1960 as Class 30 D5631. Here it joined our B12 and J15 which were already allocated there. There is every chance that the diesel worked passenger services over the M&GN line to Melton and freights to Norwich City whilst at 32A. After just four months at Norwich, it moved to Ipswich (32B) in November 1960. Here the locomotive remained until the following June when transferred back to Norwich. D5631 did have a claim to fame whilst at Norwich. On the last day of the 1961 summer timetable in East Anglia, which was also the last day of steam hauled express passenger workings in the area, an early morning Norwich to London service failed near Diss behind Britannia 70006 ‘Robert Burns’ and D5631 was sent to the rescue. It received its final exam at Stratford on 8th of February 2001, and was withdrawn from service. The loco then languished at Old Oak Common amongst several other withdrawn classmates. Having been offered by tender, the loco was purchased by the M&GN Society on 29th January 2003. It is currently being overhauled.